When people in the future look back at the departure of Jonny Howson from Elland Road, hindsight may get the better of them. Should Jonny not succeed in the Premier League, hampered by his injury, little will be said. Should Leeds United manage to get promoted from The Championship, Howson’s departure may become little more than a footnote in the annals of Leeds United, overwhelmed by the end result. However, as I feel, this day will be looked upon in the future as a genuine low point at Leeds United, on par with Woodgate’s departure that symbolised the end of the ‘living the dream’. For a man who inspired such extreme opinions, Howson’s transfer to Norwich has inspired an incredible outpouring of grief. Social networks were ablaze with anti-Bates sentiment when initial news of the transfer came out of the club, and on Saturday, a size-able protest aimed at Bates gathered before the Ipswich match and continued to voice itself throughout the match. One of the moments which symbolised the extent of the fan’s ire was the seconds that followed McCormack’s equalizer. As is natural, following a turnaround to lead 2-1, those in the Kop celebrated, but immediately followed this by chanting “Bates out” once again. Protests existed at the beginning of the season, but tailed off. Why did Howson’s sale symbolise such a momentous shift in the mindset of Leeds fans? In the view of this writer, Jonny Howson, Leeds United club captain, is simply the symbol of much of the success that has occurred at that club in the last five years. Not only this, but Howson had great potential to be the player that Leeds built the next few years of the club around. Carlisle, Jonny Howson scored the two goals that sent Leeds to Wembley under Gary McAllister. Manchester United, the day that is still sung about around the goal, Howson played the impeccable, incredibly under-rated long pass that led to Beckford’s match winning goal. Bristol Rovers, Howson scores the equalizing goal that led to the win Leeds required to gain promotion from League One. Last season, Howson scored ten goals from midfield to supplement the strikers in what was ultimately a failed joust at the play-offs. This aspect of last season truly revealed how great a player Howson could ultimately become. Simon Grayson, making him vice-captain and ultimately captain of the club, clearly saw Howson as the first name in any match day squad. In naming sides, he sacrificed prolific strikers in order to play one up front, with Howson slipping in behind Becchio. It is here that Howson revealed the force Leeds fans hoped he would become, showing himself to be a potentially great trequartista, playing as an advanced playmaker. As part of a front four of himself, Becchio, Max Gradel and Robert Snodgrass, Howson brought the other three men into play, caused havoc on the opposition back-line and looked simply unstoppable when running at a center back. Played in what had become his ‘natural’ position, given his forced adaptation into a central midfielder after a youth career playing as a striker, Howson looked a player worthy of building a team around. Whilst he played incredibly infrequently in this role this season, on the few occasions he did he looked just as devastating. Against Nottingham Forest, for example, only the second time he appeared there, with Becchio ahead of him for the first time, Howson ran the game, even scoring a spectacular volley from the edge of the area against one of the league’s top goalkeepers. Injured in the next match, Leeds fans hoped for the best when he returned. A bright future seemed ahead, with a team built around this trequartista. 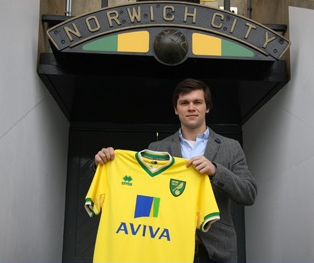 Yet Howson will now ply his trade at Norwich City. His potential is such, and especially considering that he came through the academy, that I feel this is a momentous event. Howson, upon recovery from his injury, could prove to be the most astute signing of Lambert’s yet. Genuinely a player to build a team around, Howson could easily prove to be a Premier League standard modern attacking midfielder. His potential, given the improvement over the last year alone, is almost limitless, and you can easily understand why Leeds fans are so unhappy at his departure.